This article was re-published with permission from the World Future Council. As the nuclear stand-off between the United States and the Soviet Union came to a head in 1962 with the Cuban Missile Crisis, Latin American governments became compelled to begin a process that would ensure that the region would never become the setting of a nuclear conflict. On 14 February 1967, Latin American and Caribbean nations (with the exception of Cuba) came together in the Tlatelolco district of Mexico City for a uniquely innovative initiative: to sign a treaty banning nuclear weapons from their continent. Although Antarctica had been declared a nuclear-weapon-free zone under the 1959 Antarctica Treaty, the Tlatelolco Treaty (or Treaty for the Prohibition of Nuclear Weapons in Latin America and the Caribbean) was the first to establish such a zone over a densely populated region. By prohibiting nuclear weapons in the region, the Treaty was timely in addressing the immediate threat posed by the vertical spread of nuclear weapons into the region from external nuclear powers, which during the Cold War was a common practice. But it was also far-sighted in the prevention of a horizontal spread of nuclear weapons as some of the larger states in the region had begun to develop nuclear energy industries, giving them the potential option for the future development of nuclear weapons. In fact, the multilateral framework of the Treaty proved a catalyst in the rapprochement between Brazil and Argentina and was crucial in staving off a nuclear race between the two countries. That framework included the creation of OPANAL, an agency dedicated to achieving universalization of the Treaty and ensuring compliance. OPANAL’s contribution is demonstrated by its continuing engagement in initiatives to promote the Treaty around the world, educate on the need for nuclear disarmament, and strengthen cooperation between all states belonging to nuclear-weapon-free zones. Taken together, the Treaty and OPANAL are best understood as a system which has not only achieved the denuclearisation of a region but also promotes and facilitates peace and cooperative security. The Treaty has been outstandingly successful in gaining legally binding ratification for all 33 countries in the Latin American region. The Treaty came into force in 1969 for those countries signing the Article 28 waiver mechanism allowing for entry into force ahead of complete adherence. It achieved full entry into force for all countries in the region in 2002 with the accession of Cuba. It has also been uniquely successful in gaining legally binding recognition by all five of the official nuclear weapon states recognized in the nuclear 1968 Non-Proliferation Treaty (United States, United Kingdom, France, China and Russia) not to use or threaten to use nuclear weapons against States party to the treaty. Most importantly, as the first to successfully implement a fully-fledged, legally binding nuclear-weapon-free zone policy in a highly populated area, the Treaty of Tlatelolco serves as a legal precedent and an inspiration to other regions. The significance of this success is demonstrated by the fact that to-date 114 United Nations Member States, more than half of the UN membership, have signed regional nuclear-weapon-free zone treaties (1985 Treaty of Rarotonga for the South Pacific, 1995 Treaty of Bangkok for Southeast Asia, 1996 Treaty of Pelindaba for Africa and the 2006 Treaty of Semipalatinsk for Central Asia) covering the entire Southern Hemisphere together with parts of the Northern Hemisphere with such zones. That is, ultimately, Tlatelolco’s most important legacy. "Nuclear-Weapon-Free-Zones not only contribute to averting regional nuclear proliferation but also lead to global nuclear disarmament: we should attempt to achieve a gradual broadening of the zones of the world from which nuclear weapons are prohibited to a point where the territories of Powers which possess those terrible tools of mass destruction will become something like contaminated islets subjected to quarantine." To fully understand the Treaty’s effect and importance, one must appreciate the zeitgeist of those Cold War years: the world had stood on the brink of nuclear war during the Cuban Missile Crisis of October 1962, the nuclear arms race between the Soviet Union and the United States had reached dizzying speeds (each side churning out hundreds of nuclear warheads every month even though the capacity to exterminate humanity had long been surpassed), the concept of Mutually Assured Destruction (MAD) had started to play a major part in both countries’ defence doctrines and the number of nuclear-armed countries had grown to five in two decades with many expecting that number to grow much faster in the coming years. As a result, people the world over experienced a sense of helplessness and fatalism about the future of humanity. It is against this backdrop that the significance of the Tlatelolco Treaty comes into clearer view. Through the Tlatelolco project, Latin America and the Caribbean loudly and clearly said NO to nuclear weapons. The importance of this emphatic rejection of the notion that you can base your security by relying on these instruments of annihilation cannot be overstated. Half a century since the Treaty was opened for signature, the nuclear threat is still with us and continues to morph into hitherto unfathomable menaces, including nuclear terrorism, cyber threats to nuclear systems and the continued risks of launch by accident or miscalculation. Those states possessing nuclear weapons show no intention of honouring their obligations under international law to fully disarm their arsenals. Rather, they seem committed to preserving their nuclear capability indefinitely, spend vast sums on upgrading and maintaining their arsenals and continue to premise their security and defence postures on the threat of waging nuclear war. So, what can we still learn from Tlatelolco today? Firstly, the Tlatelolco Treaty still serves as an inspiration and model for additional nuclear-weapon-free zones. Recent zone proposals cover regions with complex security environments as well as nuclear doctrines, including the Middle East, Northeast Asia, the Arctic, Europe and South Asia. While each is different in scope and background, advancing these proposals could benefit greatly from lessons of the Tlatelolco experience and the expertise of OPANAL. Secondly, the Tlatelolco process can inspire both nuclear-armed states and non-nuclear countries alike in advancing other nuclear disarmament initiatives. The extraordinary persistence, creativity and foresight of the drafters of the Tlatelolco Treaty is sorely needed today. Meeting of the Ministers of Foreign Affairs of Latin America and the Caribbean adopting a declaration on 50th anniversary of the Tlatelolco Treaty. 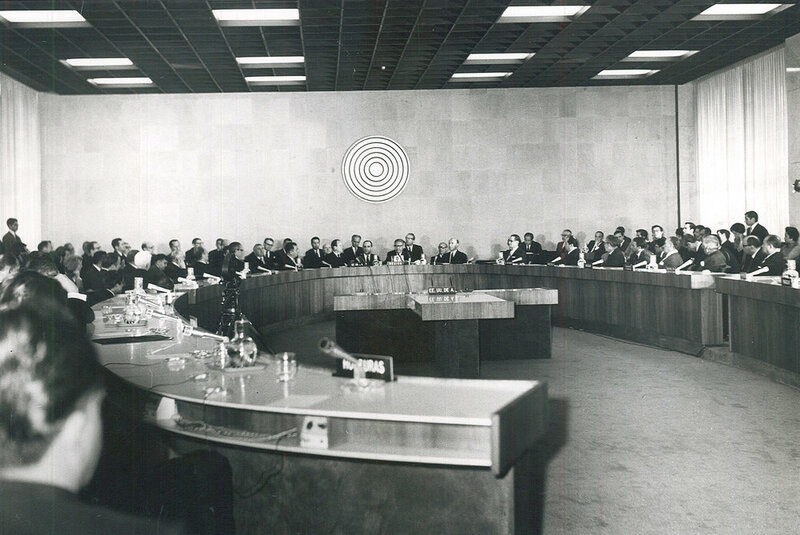 Tlatelolco placed humanitarian concerns about the indiscriminate effects of nuclear weapons at the heart of the initiative. Perhaps it is no surprise that Mexico, the driving force behind the Tlatelolco Treaty, has emerged as one of the leaders in a new initiative by non-nuclear-weapon states that frames nuclear disarmament around the catastrophic humanitarian consequences of nuclear weapons’ use and seeks to negotiate a global treaty banning nuclear weapons. But Tlatelolco also refuted the notion that nuclear weapons address security needs. Rather, it demonstrated that national, human, ecological and global security are better served by the absence of nuclear weapons. Such a rethinking of the supposed security benefits of nuclear weapons needs to take place today in the nuclear-armed states and their allies as the world faces a range of interconnected security threats, including climate change, pandemic disease and demographic change, none of which nuclear weapons address. Let us try to recapture the extraordinary persistence, creativity and foresight of the initiators of the Tlatelolco Treaty and achieve what they always had in mind: the universal prohibition and elimination of nuclear weapons. The World Future Council works to research, identify and spread the best and most sustainable policy solutions worldwide for a peaceful future.